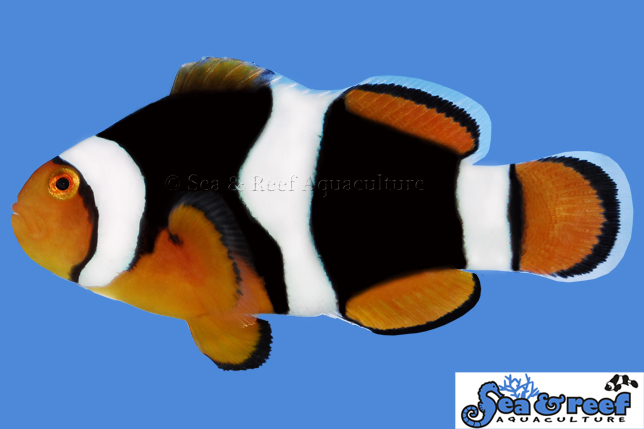 Onyx Clownfish is a Percula Clownfish with jet black coloration between the white stripes. Fish breeding pioneer Bill Addison was responsible for bringing the purest black onyx clownfish to the hobby by selective breeding of many generations of Percula Clownfish with the blackest markings. He started this line by establishing more than 50 breeding pairs of Percula Clownfish with darker than usual coloration. He then selected the offspring with the blackest coloration and established the C-Quest line of Onyx Percula Clownfish. To this day the C-Quest Onyx Percula strain represents the highest quality in the hobby. We have selected some of the best C-Quest Onyx Percula for our broodstock and we are proud to present you with their offspring. The temperament and captive care requirements for Onyx Percula Clownfish is identical to that of the regular Percula Clownfish. It is very peaceful and hardy. They thrive in saltwater aquariums with or without an anemone present. Like the regular Percula Clownfish the Onyx Percula Clownfish will readily accept a wide variety of host anemones and many hobbyists keep the Onyx Percula Clwonfish with the popular and hardy Bubble Tip Anemone (Entacmaea quadricolor). As a reference the natural host anemones of the regular ocellaris clownfish are Magnificent Sea Anemone (Heteractis magnifica), Sebae Anemone (Heteractis crispa), and Giant Carpet Anemone (Stichodactyla gigantea).